Our home insurance quote and buy service is provided by The Source, who have been working in partnership with major UK home insurance brands for the past 23 years. 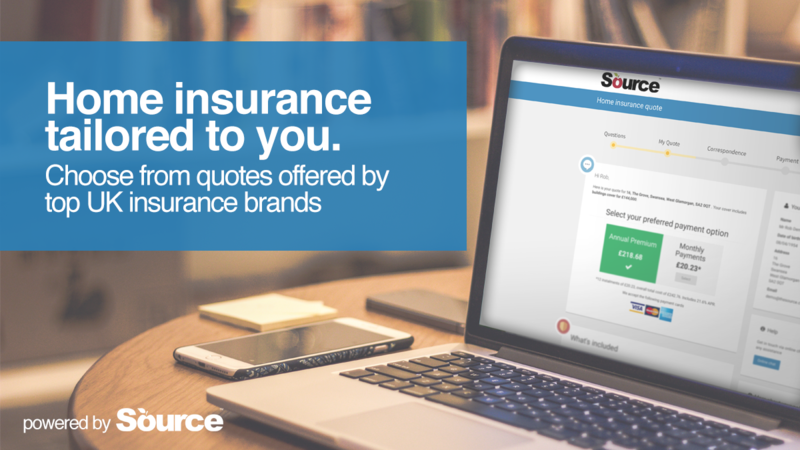 When you quote via this service, the Source will search their panel of insurers for the policies that match your personal circumstances. By using a panel of insurers, you will have access to a range of cover and price options to choose from. When you quote with the Source, the price you see is the price you pay and you can purchase there and then. Our quote system is available to use on any smart device and will guide you through a quote to provide you with the reassurance the things important to you are covered. Cover for properties with specialist risks such undergoing renovation, unusual build or design and many more. At renewal, we will automatically check to see if we could offer you a cheaper premium from our insurance panel. Support from our UK based contact centre of insurance specialists. You are now leaving the Temple Bar website, and are being connected to a third party web site. Please note that Temple Bar is not responsible for the information, content or product(s) found on third party web sites. Temple Bar Independent Financial Advice Ltd is registered in England and Wales no. 3711518. Registered office, Independence House, 4 Beckett Road, Worcester, WR3 7NJ. Authorised and regulated by the Financial Conduct Authority. Temple Bar Independent Financial Advice Ltd is entered on the Financial Services Register https://register.fca.org.uk/ under reference 401740.